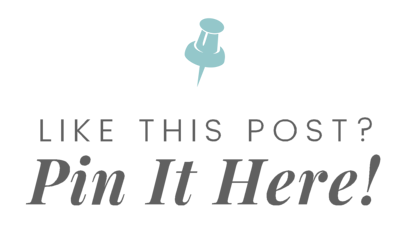 Mason jar craft ideas are great for all seasons! If you’re gearing up for fall, you won’t want to miss these fall Mason jar ideas for centerpieces. Are you craving fall and all that the season has to offer like crisp air and pumpkin flavored everything? Yep, I’m a fan of fall myself! Quick side note, if you are a huge fan of pumpkin, be sure to try this pumpkin spice oatmeal and this pumpkin spice parfait. 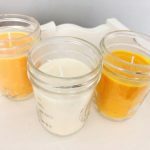 I especially like bringing fall colors (oranges, reds, yellows) into my home, and I’ve found that Mason jar craft ideas are a fun and frugal way to do so. 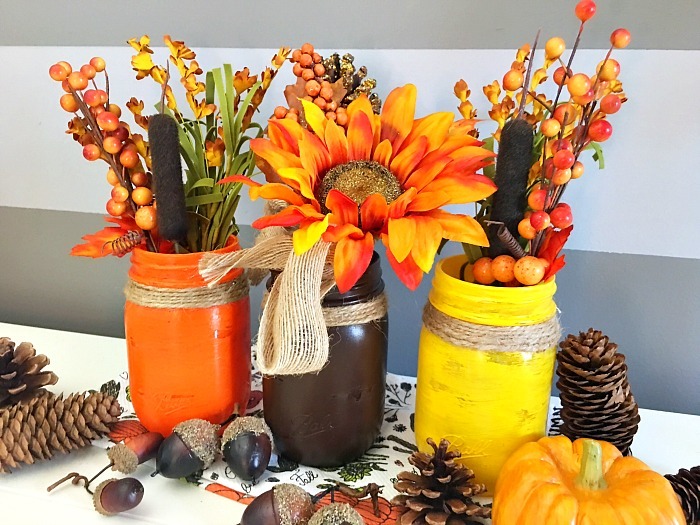 Lucky for me, there are plenty of fall Mason jar ideas to choose from including this one for DIY fall décor centerpieces. One thing I really like about these Mason jar craft ideas for fall Mason jar décor is that you can use them for more than just fall. In fact, thanks to the colors, you could easily keep these centerpieces around through Thanksgiving. I also like using Mason jars for fall decorations and DIY projects in general because they’re pretty inexpensive and easy to work with. Plus, they have a lot of different uses. If you’re looking for an easy, fun, frugal, and pretty Mason jar craft idea (specially fall Mason jar ideas) be sure to check out these rustic centerpieces! 1. Cover the work surface you’ll be using to make this fall Mason jar décor with scrap paper or newspaper. 2. 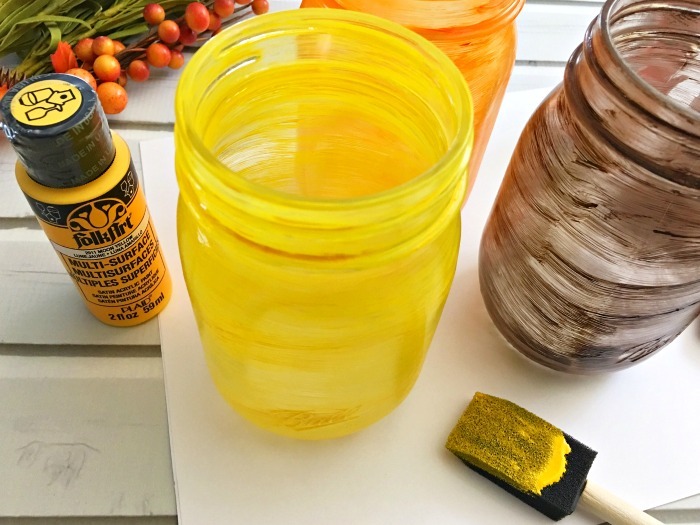 Using a foam paint brush, paint each Mason jar a different color (one orange, one yellow, and one brown). 3. Allow jars to dry. 4. Apply a second coat of paint to each jar. 5. Allow jars to dry. 6. 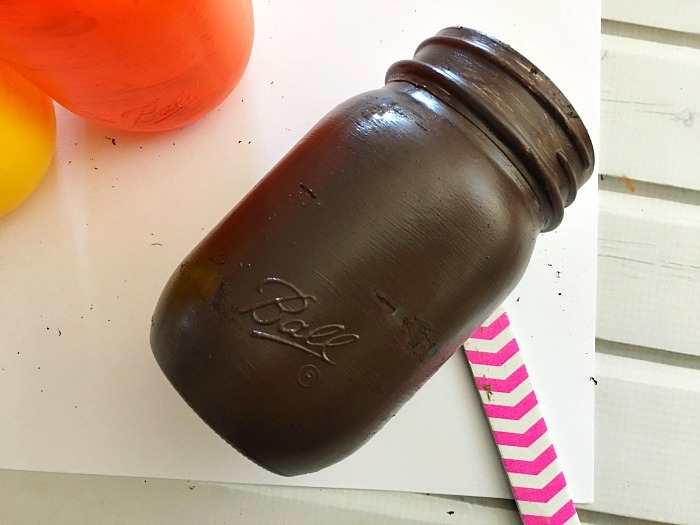 Use a piece of sandpaper to lightly sand off spots of paint on each Mason jar. The goal here is to create a rustic look. Tip: Don’t have sandpaper? You can use a nail file instead. 7. 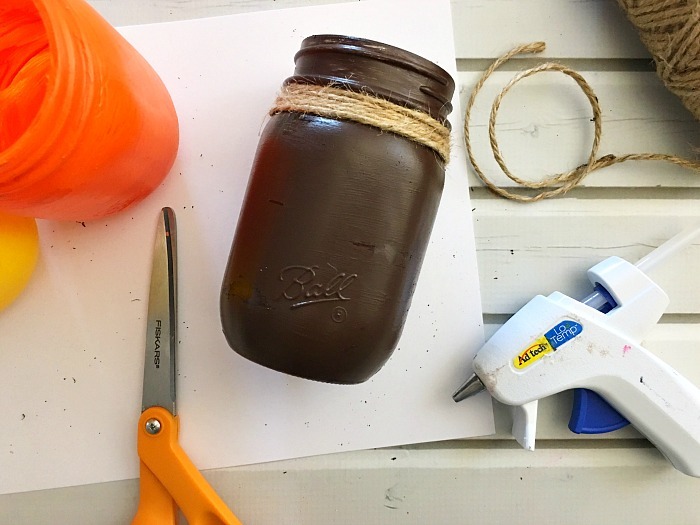 Using a hot glue gun, carefully glue the end of a piece of twine onto the back of each Mason jar, just below the rim where the lid would screw on. 8. Wrap the twine around the Mason jar five times, just below the rim. 9. Cut the twine, and secure the loose end with hot glue. 10. 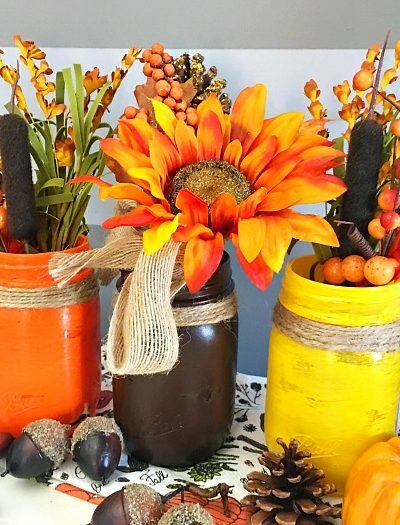 Fill each Mason jar with fall flowers, and enjoy your DIY fall décor! 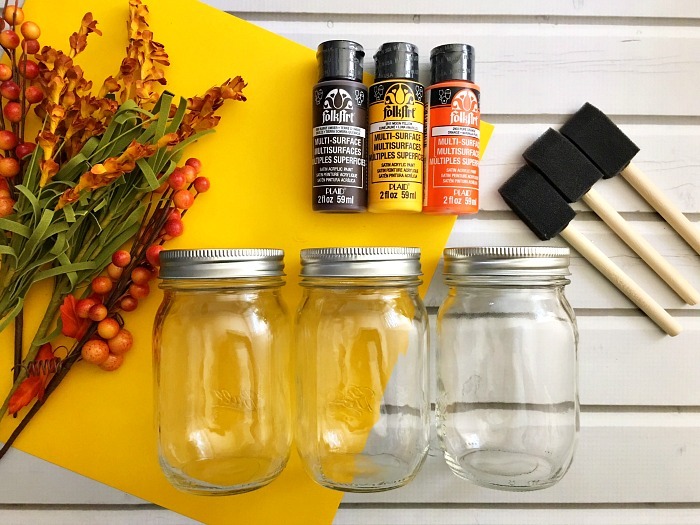 What are your favorite Mason jar craft ideas for fall? Please share in the comments.